These ten days will be the longest course that Keith gives in 2016. This is your opportunity to spend a minimum of 40 to 45 hours with him (generally 5 hours per day). Meet the master and learn about improvisation directly from the source. Keith Johnstone graduated from the Royal Court Theatre in London and worked there as chief dramaturg and stage director from 1956 - 1966. He taught at the Royal Academy of Dramatic Art, until he moved to Canada. Since then he has taught and made workshop at many leading performing arts schools and universities in Europe. He has been a guest teacher at The Danish National School of Performing Arts for over 15 years. "If you've studied with me you'll know what to expect. If not, then my book 'Impro' will give you some idea. Basically, I try to stop people trying to be original and talented and spontaneous - because they're all those things already! I'll teach what I always teach: work on the basics plus some work on Maestro™ (the elimination game that I invented that is becoming more popular) and perhaps give some sort of introduction to the Life Game™. I try to shape my courses to the needs of the group." 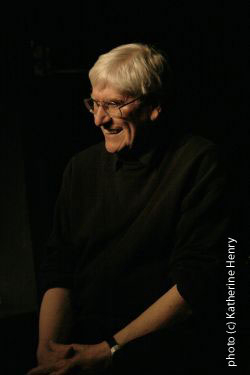 Keith Johnstone is one of the few internationally recognized authorities in the field of improvisation, great chunks of which he created, including improvisation forms that include Theatresports™, Micetro Impro© (or Maestro Impro), Gorilla Theatre™, and The Life Game©. Theatresports™ is known worldwide, and London's Improbable Theatre Co. (directed by Phelim McDermott) recently toured Great Britain with the Life Game to excellent reviews. His books Impro, and Impro For Storytellers, have been translated into many languages. Keith leads master classes in improvisation for a variety of groups from Stage Performers, to Clinic Clowns, to Psychotherapists. Since November 1998 Keith has held workshops in San Francisco, Brisbane, Sydney, Seattle, Vienna, Denmark, Germany, Sweden, London, Hong Kong, Austin (Texas), and Tokyo. He founded the Theatre Machine improvisation group, the International Theatresports™ Institute, and was the Co-founder of Calgary's Loose Moose Theatre.